Frank Lloyd Wright was America’s most famous architect and one of the world’s greatest architects of the 20th century. Many features of modern American homes were first introduced by Wright. His innovations include: open floor plans, combined living and dining areas, central utility cores, radiant floor heating, large floor-to-ceiling windows, skylights, glass-skinned buildings, pre-cast concrete, slab-on-grade foundations, interior atriums, cantilevered balconies, wide overhangs, carports, drive-thrus, built-ins, modular construction, and homes oriented around a back patio instead of a front porch. 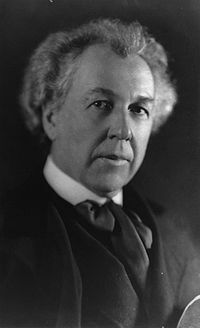 Frank Lloyd Wright was born on June 8, 1869, in Wisconsin, just two years after the end of the Civil War. Both of Wright's parents were strong-willed individuals with idiosyncratic tendencies that they passed on to Frank. His extended Welsh family consisted largely of farmers, teachers, musicians and ministers. Wright's early childhood home was the agricultural town of Richland Center, but when he was seven years old the family moved to Weymouth, Massachusetts. Wright’s mother, Anna Lloyd-Jones, was determined that her son would be a great builder. She decorated Frank’s nursery with pictures of beautiful cathedrals to inspire him with that ambition. She also purchased a set of educational blocks created by Friedrich Froebel, founder of the first kindergarten, who used the manipulatives as part of his innovative curriculum. The geometrically-shaped blocks of various sizes could be assembled in different combinations to form three-dimensional compositions. Many of Wright’s buildings are notable for their geometrical clarity and aesthetic symmetry. Wright’s mother took an active interest in Frank’s education and began homeschooling him at the kindergarten level. Frank’s father, William C. Wright, also had a large impact on his son’s life. Able to play a dozen instruments, he introduced young Frank to the music of Bach and Beethoven while teaching him to play the piano, violin, and cello. He also told him about the importance of acoustics and the way in which sound vibrates off walls. Wright went on to design many churches and other buildings with great acoustics, including Grady Gammage Auditorium at Arizona State University. Frank continued to be homeschooled until after they moved back to Wisconsin. There Wright attended a traditional classroom for four years, from 1879 to 1883, between the ages of 11 and 15. Every summer, when school was not in session, Wright went to live and work on his uncle’s farm. His uncle, James Lloyd-Jones, taught him to pay attention to the patterns and rhythms of nature. These lessons would also find their way into Wright’s later work. Two of Frank Lloyd Wright's aunts, Jane and Nell Lloyd-Jones, started a country boarding school called the Hillside Home School. Their philosophy regarding the education of children was based on the principle of learning by doing. This was a radical departure from most educational practices in those days and their ideas also influenced Wright. At the age of 15, Wright entered the University of Wisconsin as a special student. He studied civil engineering because the school had no course in architecture. In 1886, after three semesters at the university, Wright became impatient with the formal academic requirements and rigid educational setting. The 17-year-old headed to Chicago to pursue his career. Wright never did attend architecture school and was mostly self-taught in that field. Wright became an apprentice and draftsman in the firm of Adler and Sullivan. Louis Sullivan is known as the “father of modern architecture.” He developed the sleek shape of the steel-framed skyscraper in late 19th-century Chicago at a time when technological advances, urban growth, and economic forces made it feasible to abandon traditional construction methods and utilize cheap, versatile, mass-produced steel. Most new buildings at that time were still being decorated with classical Greek and Roman-style arches and columns, or highly decorated like Victorian “gingerbread” houses. But it was Sullivan who popularized the phrase “form follows function,” meaning that the design of a building should derive from its use. As Sullivan’s assistant, Wright adopted that same principle and soon attracted much attention because of the new styles of buildings he designed. He used simple lines and no superfluous decoration. Wright wanted to give as much freedom and space as possible to the people in a building. He designed a series of “prairie houses,” which were long and low with rooms that open into one another and very few dividing walls. The modern ranch style homes originated from these. Wright began attracting considerable recognition and many clients who liked this new style of residential architecture. Wright established his own architectural practice at his Oak Park home in 1893. During these early years, Wright mostly designed homes and office buildings in nearby towns. Eventually his innovative building style spread overseas. In 1915, Wright was commissioned to design the Imperial Hotel in Tokyo, Japan. It was completed in 1922 and survived the great Japanese earthquake of 1923, which destroyed many other structures. Despite his professional success, Wright’s personal life was beset with scandal and tragedy, and he was declared bankrupt in 1929. Wright went to Phoenix as a consultant on the design of the Arizona Biltmore. While there, Dr. Alexander Chandler approached him with a proposal for a similarly luxurious resort named San Marcos in the Desert. However, that and most other construction projects were doomed by the stock market crash of 1929 and the Great Depression. Wright returned to his childhood home, where he wrote his autobiography. It was published in 1932 and became a form of advertising, leading many readers to seek out the master architect. In the late 1930’s, Wright once again began to receive more clients. By this time, he had gathered a following of young architects. Thirty students came to live and learn at Wright’s home/school/studio in Spring Green, Wisconsin. He called it “Taliesin” after the Welsh poet whose name means “shining brow,” because it was positioned on the brow of a hill. Wright strongly supported the apprentice system which he, himself, had experienced. So he founded the Taliesin Fellowship to train the new architects. In 1939, Wright was 70 years old when he and his fellows built Taliesin West in the foothills of the McDowell Mountains northeast of Scottsdale, Arizona. At that time it was a desolate parcel of desert land with no roads, and water had to be hauled up in milk jugs. He lived and worked there during the winter months for the next twenty years. Wright was always a firm advocate of residing and working in the same place, thus avoiding traffic and other stresses, presumably making for a better life. Following another relatively inactive period during World War II, Wright amazingly entered into his era of greatest activity when he was in his 80’s. Wright designed about fifty homes and buildings for the Phoenix metro area, about one-third of which were built, some finished posthumously by Taliesin Associated Architects. Wright died in Phoenix at the age of 91 on April 9, 1959. Taliesin West continues as the headquarters for The Frank Lloyd Wright Foundation and the Frank Lloyd Wright School of Architecture. Wright’s philosophy of life, learning, and work can still be found at Taliesin. The students learn experientially, supplemented by classes and workshops, and surrounded by a natural environment. Their hands-on education includes working in the community garden, cooking and cleaning in the kitchen, maintaining and remodeling campus structures, studying music and Shakespeare, and participating in social events. The school accepts applications year-round from creative, self-motivated students. Tours of the home and school are conducted on a regular basis. Altogether, Wright designed more than 1,000 projects, about 700 of which resulted in completed works. The late architect’s designs for homes, hotels, and commercial buildings are still being used today. The famed architect also left behind a treasury of decorative furnishings including chairs, tables, lamps, carpets, windows, doors, art prints, and even clothing. His 70-year career has been called the longest and most creative of any architect in modern American history. Did You Know…? Frank Lloyd Wright, Jr. (1890-1978; also known as Lloyd Wright) worked with his father on the elder Wright’s 1920’s California homes. He later established his own architectural practice in California. His most famous project is the Wayfarers Chapel overlooking the Pacific Ocean in Palos Verdes, California. John Lloyd Wright (1892-1972) watched his father build the foundation of Tokyo’s earthquake-proof Imperial Hotel. This inspired him to invent Lincoln Logs in 1918 and he also designed Timber Toys. Frank Lloyd Wright for Kids, by Kathleen Thorne-Thomsen. Frank Lloyd Wright: An Autobiography, by Frank Lloyd Wright.